Artesonraju is a beautiful pyramid mountain which you may recognise from the Paramount Pictures movie logo. 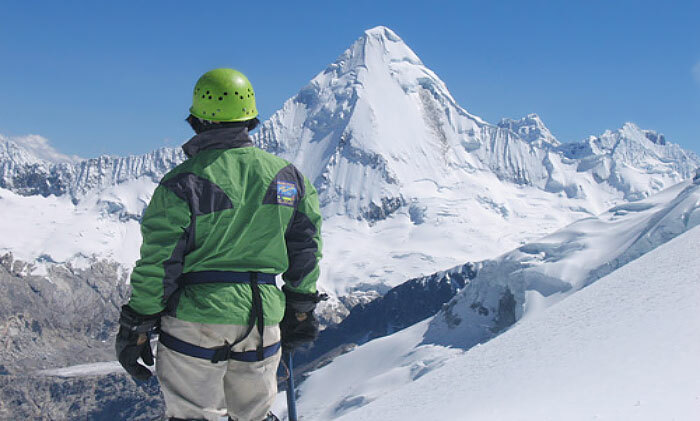 It is a technical & difficult mountain to climb, with steep hard ice which can be mixed with soft, deep unstable snow and several serious ice pitches and is only recommended for experienced & confident climbers. In recent years, Artesonraju has unfortunately been the scene of several serious accidents. Conditions on Artesonraju are often difficult and unstable. 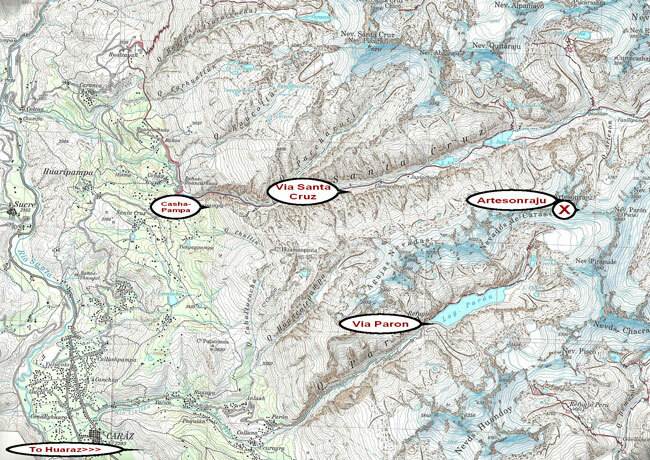 Generally each year the route on one of the faces proves to be dangerous with high avalanche risk and climbing is only attempted from the alternative route. The decision as to which route is in safest condition to climb often cannot be made until just weeks before or even days before the climb. When planning your trip you should allow extra days in the event that the climbing is moved to the longer North East route for safety. Day 1: Drive from Huaraz to Caraz and then on to Laguna Paron (3½ to 4 hours) then we trek around the lake to either camp at the head of the lake (1½ hours) or climb up above the lake one hour more to a nice camp in trees by a stream (4200m). Day 2: We climb up on a moraine ridge. Camp either on the moraine just below the glacier 4900m (1½ to 2 hours), or climb about another 2 hours up onto the glacier and camp in High Camp on the ice at 5100m. Day 3: We leave camp early for the summit climb. 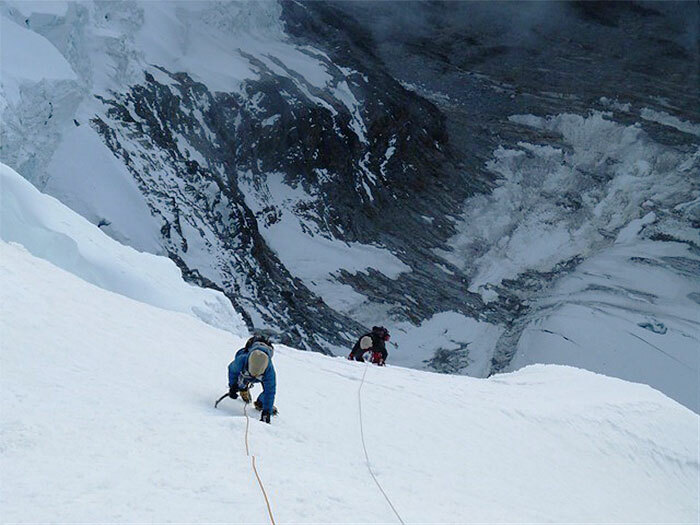 The route average steepness is between 45° and up to 70° with some pitches up to 85°. Often the climb commences with long stretches of soft snow before turning into hard ice as altitude increases. The slope gets steeper on the two last pitches of 100m requiring belays. 12 to 14 hours for the day. Day 4: Descend to Base Camp. Day 5: Walk around the lake to meet our van which will take us back to Huaraz. Timing: 6 days (optional 7 days). Day 1: Drive 2 ½ hours from Huaraz to Cashapampa (2900m). Our gear is loaded onto donkeys and we hike 4 to 5 hours up the Santa Cruz Valley to camp near the river at Llamacorral (3750m). Day 2: An easy walk 5 hours up the valley still following the Santa Cruz route before turning off & making a short climb up to Base Camp Artesonraju which is situated almost at the base of Artesonraju at 4250m. Day 3: Hike up through some low scrub & trees to reach a moraine ridge. We climb up the moraine ridge (sometimes slippery and steep) for about 5 hours until we reach the Morena Camp at 5000m. Day 4: A short climb through the rocks to reach the glacier. About 4 hours climbing up the glacier on slopes 35° to 40° negotiating around crevasses and exposed ice bridges. 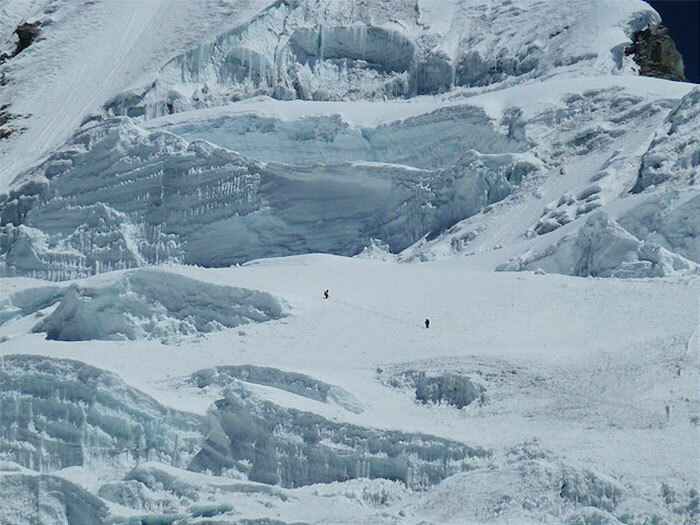 There is a short steeper slope to climb just before reaching High Camp at 5600m. Day 5: Summit Day. An early start, beginning with climbing an ice wall up to a 65°, followed by a gentle slope leading up to the final ice wall around 280m of 70° a 80° slope. After the ice wall there is a false summit which involves negotiating around an exposed crevasses to reach the true summit. Descend by the same route to either Base Camp or stop at Morena Camp for the night. Around 12 to 14 hours. Day 6: Hike out to Cashapampa 7 to 8 hours where our private van will be to return us to Huaraz. OPTIONAL Day 7: Extra Day in case of bad weather or for rest.